The microwave has short wavelength, high frequency, energy saving and environmental protection, and is widely used in various fields of the industrial industry, such as industrial microwave heating. Microwave heating is a heating method that relies on an object to absorb microwave energy and convert it into heat energy to heat the whole particle at the same time. It is completely different from the conventional heating method. In the traditional heating mode, the heat is always from the surface to the inside, and the material will inevitably have a temperature gradient, resulting in surface overheating, core part less heat or uneven heating. Microwave heating technology overcomes these problems. It raises the temperature of the material by the "internal friction heat" of the heated body. Without any heat conduction process, the inside and outside of the material can be simultaneously heated and heated at the same time, and the heating speed is fast. 1. Uniform heating and fast speed. 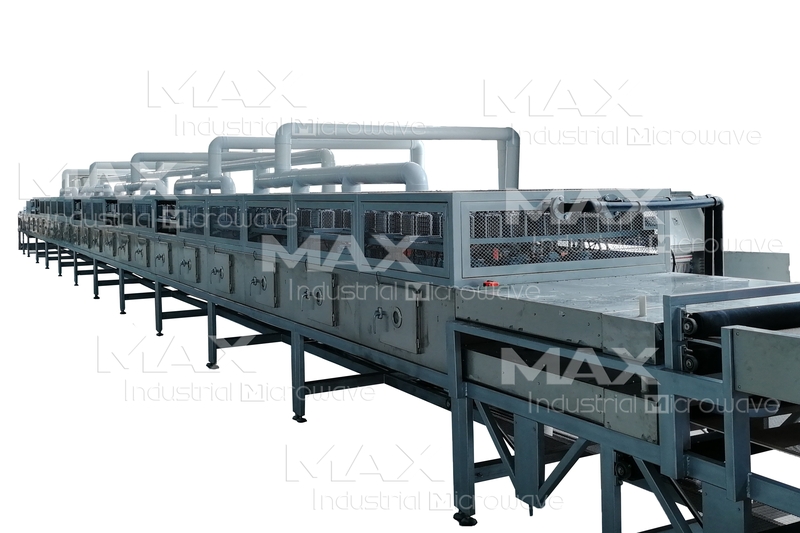 The conveyor tunnel microwave machine is capable of heating thousands of meal box per hour, it will not cause the phenomenon of "uncooked in the outer coke", which is conducive to improving the product quality. At the same time, the heating time is greatly shortened due to "heating at the same time inside and outside". In the process of microwave heating, rapid control of temperature rise and fall can be realized, which is beneficial to realize automatic control. 2. Control is timely and responsive. Under the conventional heating method, it takes a certain time to reach a certain temperature. In the event of a malfunction or stop of heating, the temperature drop takes a long time. Microwave heating quickly heats the temperature of the space to the appropriate temperature in a matter of seconds, facilitating automation and continuous production. 3. High temperature sterilization. The temperature of the microwave heating is controlled to a certain value, which will generate a field high temperature, which can produce a bactericidal effect without affecting the quality of the product. 4. Strong penetration. The penetration ability of microwaves is better than that of far infrared rays. When using far-infrared heating, only a thin layer of the object generates heat, and the heat is mainly conducted to the inside, so that not only the heating time is long, but also the heating unevenness is easily caused. In contrast, the penetration of microwave heating is much stronger than that of far infrared heating. 5. Clean, no pollution. The microwave heating equipment has a small footprint, avoids the high temperature of the environment, and the working conditions of the workers have been greatly improved. We have been engaged in the production of microwave heating equipment for many years, and have been focusing on the upgrading of technology and the cost-effective upgrade of products. We have a wide selection of microwave heating equipment to choose from and provide online technical support and guidance. Our microwave heating equipment has received very good job performance feedback in large-scale events, factories and other occasions, and has attracted more and more attention all over the world. We focus on quality and provide you with the services in place.